How To Solve IRS Corruption – Give Them More Power? 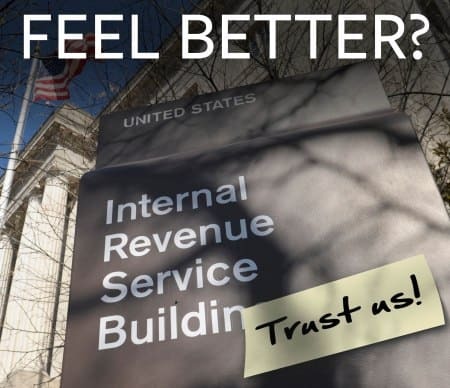 Don’t Worry, the IRS is In Control! The IRS abuses it’s power to target conservative groups. The IRS is a huge risk for being used as a political tool to silence opposition. Give the IRS more power to restrict your free speech and the free speech of the organizations that you start or join in order to try to influence your fellow Americans. Yep. Really. These are the progressive statists that we have elected in action. Under the proposed new rules, organizations that fall under the tax-exempt 501(c)(4) umbrella would also be more clearly identified during campaigns. The new guidance would curtail activities such as running ads, distributing campaign literature and other get-out-the-vote initiatives. The American Center for Law and Justice (ACLJ), which is representing 41 organizations in a federal lawsuit challenging the IRS, says the proposed regulation change puts free speech rights of Americans at risk.